We’re not all into the highend smartphones. Some of us use it more for work than any other purpose. Some phones are just so pretty, they can’t handle the rough life. Welcome the new Kyocera Torque. 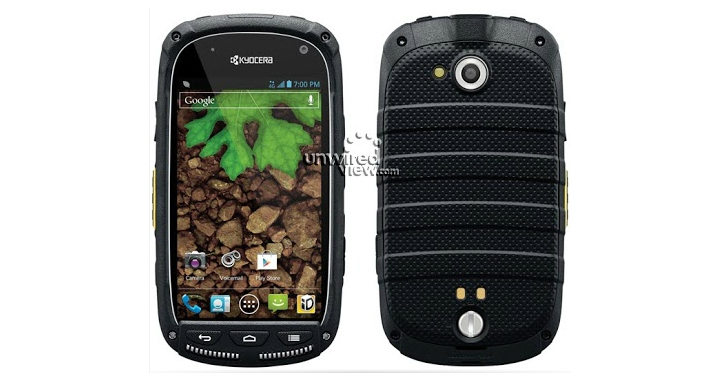 Arriving in a couple of weeks at Sprint, the Kyocera Torque is made to handle the tough life. Built to survive extreme elements, the Torque is waterproof and dirt proof. I recommend this phone to outdoorsy types or those with kids who like to test devices in water. Just because the phone is rugged, doesn’t mean that it’s not jam-packed with features. It has 4G capabilities and push-to-talk direct connect. You can purchase the phone at any Sprint store for $100 (after a $50 rebate) beginning March 8th. Built to Military Standard 810G, Torque is made to withstand water, dust, shock, vibration, solar radiation, humidity, and extreme temperatures, along with IP67 standards for dust and water immersion. 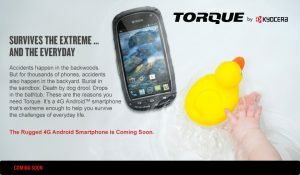 Waterproof whether sprayed or immersed in up to one meter of water for up to 30 minutes, Torque can handle all the rain, sprinklers, hoses, spit, drool, drinks, sinks or toilet water life can throw at it – that’s more than can be said of the around 82 million handsets in the U.S. that have already been destroyed by liquid. Extreme Temperatures of -22° to 140°F (-30° to 60°C) for a non-operating unit for two hours and -4° to 122°F (-20° to 50°C) for an operating unit for three hours – from backcountry snowboard trips to hikes in Death Valley, don’t sweat it. Dropped 26 times from 4 feet high – or, the average week with kids at the playground. Heavy dust for six hours – going off the grid while off-roading and camping will never be an issue. Horizontal, vertical and sideways vibrations for one hour – that mountain bike ride or roller coaster will be no match for Torque. Exposure to salt fog, for a complete 48 hour cycle; this cycle includes 24 hours exposure to salt fog followed by 24 hours drying time – ideal for surfers, beach lovers or those who left their hearts and phones in San Francisco. 95 percent humidity for 10 days straight – the phone can handle it, but its owners may not. Solar radiation exposure of 1120 W/m2 for 24 hours – you might need sunscreen, but your phone doesn’t mind soaking up some rays. Low pressure at 57.11 kPa/15,000 feet (4,572 meters) for two hours – higher than the tallest mountain peak in the lower 48 U.S. states.